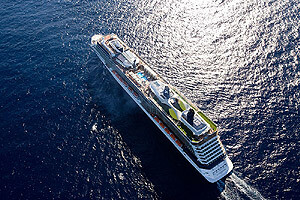 Celebrity Cruises have announced the next two ships to join their Solstice class, the Celebrity Silhouette and the Celebrity Reflection, will be hosting more Avante-Garde industry firsts. The new ships latest innovations include AquaClass suites (only on Celebrity Reflection), The Lawn Club Grill, The Porch and a new Michael's Club concept. Due to the popularity of the lines industry-first AquaClass, spa-inspired accommodation, Celebrity will be introducing the lines first AquaClass suites onboard the Celebrity Reflection. The new suites will offer 251 square feet of luxury along with a 57 square feet veranda and all the facilities AquaClass guests have become accustomed to. “We gave a great deal of thought about how to ideally accommodate everything we’re adding,” said Hanrahan. “We’re widening the ship slightly, enabling us to introduce each of these exceptional new venues without compromising the Celebrity’s premium space ratio and lauded traffic flow. The Lawn Club Grill is the industry's first outdoor, interactive grill venue. The Porch offers chic, Hamptons-style design and modern furniture and will serve fresh-baked pastries and breads. Both these venues will be set around The Lawn Club and take advantage of the lush lawn and stunning views. Michael's Club, a Celebrity favourite, will be re-styled offering an elegant bar serving rare malts, whiskies and scotches along with a selection of 50 beers including the likes of Chimay Blue. The venue will feature live music and 46" TVs to show those all important sporting events. There are plenty more additions to come with Celebrity showing they mean business with the new Solstice class ships.